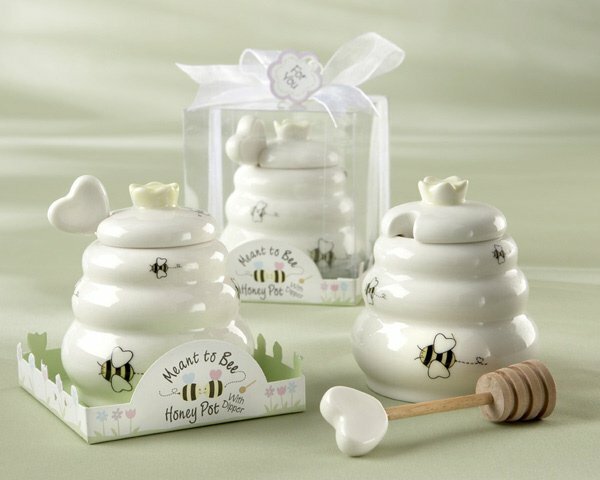 Your guests will be 'abuzz' with excitement when you present these adorable honey pot favors, complete with wooden dipper! Each sweet favor features a ceramic beehive-shaped honey pot with a notch in the lid for the wooden dipper to remain in place. 'Bee'autifully presented in a clear gift box with a garden of purple, pink and blue flowers on the bottom and a bee couple surrounded by the words 'Meant To Bee'. The favor is finished with a white organza ribbon and a flower-shaped thank you tag. NOTE - honey not included! Can u change the writing from 'meant to bee' to 'parents to bee' ? I'm sorry the text 'meant to bee' can't be changed. Can only one be purchased and is it the actual size? Also if more that one is purchased, is the price next to quantity the prize per item? Yes you can order one and the price is based on the quantity you purchase. The higher the quantity the cheaper and the price is listed above the description. Also, this the honey pot measures 3' high and 2 3/4' in diameter. I am wondering if you guys offer price match? Favorsltd.com also has these at a price of 2.95 for a quantity of 50.